Bob Dean is a collaborator, innovator and talent developer. His firm, Dean Learning & Talent Advisors LLC, consults with companies on learning and development, talent management and customer experience. He is a ”Certified Experience Economy Expert” and joined the first group of professionals certified by the authors of The Experience Economy, Joseph Pine and Jim Gilmore. The book explores the opportunities that businesses have in order to create a better experience within whatever platform they’re on. Bob is passionate about virtual meetings, virtual collaboration and virtual learning – he has been ever since he saw the first virtual meeting platform in 1997 – but the PowerPoint platform has had a negative impact on both face-to-face business and virtual experiences. Bob was very excited about the potential for the virtual classroom because he envisioned subject matter experts being able to extend their reach to many, many more people than they ever could in a classroom. He thought we would have a revolution on learning with virtual classrooms. Unfortunately, we’re 20 years later and it really has not taken off as much as he had hoped and expected, and a lot of that is due to the challenges with virtual facilitation. Bob has used a lot of virtual web platforms, but ThinkTank is the game changer for virtual collaboration. ThinkTank is over 25 years old and the company developed many of the guiding principles for best practices in collaboration, including the importance of anonymity. Anonymity is a critical element of virtual collaboration and education because participants are more honest, open and eager to participate. Confidence. You need the confidence to direct people who you can’t see or identify. Improvisation. You’re dealing with the unknown so you have to be listening to what is being said, whether that listening is what has been written or on the call, and you have to be completely focused in order to adapt to the situation. Improvisational skills are viewed by many business people as something that is fun and out-of-the-box, but not necessarily totally relevant to the way they interact with each other or with clients. However, in a world with instant communication, instant responses are critical to both face-to-face interactions and virtual interactions. It requires some level of improvisation to be able to respond quickly, with helpful information. Improvisational facilitation ties back into the experience economy because working with different participants and adapting ThinkTank to provide different types of classroom experiences allows participants to retain more information than they would from a PowerPoint-driven type of presentation. I greatly appreciate Bob for taking the time out of his schedule to teach us about virtual learning, virtual collaboration and virtual facilitation, and how they relate to improvisation. Peter: Hey everybody, thanks for tuning in. I’m with Bob Dean, who’s a collaborator, innovator and talent developer. First and foremost, Bob, thank you so very much for taking time out of your busy schedule to be part of my podcast. Bob: My pleasure, Pete. Anything for you. Peter: Oh thank you so very much. Bob, why don’t you take a moment and tell the audience a little bit about Bob Dean. What you do, how you got to where you are. Just so everybody has like a baseline before we get into our conversation. Bob: Okay, sure. Well, my fundamental background is I’m a CPA. I started out in public accounting right out of college and spent seven years doing audits of public companies, middle-market companies. It was a tremendous experience and foundational in my career, and that was with one of those, at the time, big firms and I quickly moved into learning development, by chance. I became part of the audit education team of what was then Arthur Young and, as Ernst & Young became a merged firm, I was head of audit training for the firm. And then I got into a lot of technology and learning innovation, so I was very intrigued when the internet first came out and we got laptops in these firms, in trying to find new ways to do learning beyond the classroom. So I spent 25 years at EY and then I became the Chief Learning Officer of Grant Thornton, and that’s when I moved to Chicago. That was a great experience. That firm had a much smaller firm, at the time a big four, but was really ready to do a lot of learning innovation. Then I became the Global Head of Learning for Heidrick and Struggles executive search firm, which is where I really got more into the talent management, talent development area. That’s what that firm does – they’re focused on talent and helping companies find the best talent. So that’s my career in large companies, Pete, but since then I’ve had my own firm consulting with companies on learning and development, talent management and, one of my new favorite topics, customer experience. I got certified in a book called the Experience Economy, which I know you’re aware of, about 10 years ago and that was pretty life-changing for me because I believe that learning and development needs to be a life-changing experience for people. I’m working on uber learning, as you’ve called it. Learning innovation with virtual classrooms and e-learning, and many other things right now. So long answer but hopefully that’s helpful. Peter: I think it is. We met back in 2011 at the Business Learning Institute’s thought leader conference and what struck me on your “TEDTalk” that we did that day was this whole thing around the experiential economy and it’s really piqued my interest. As I’ve gotten to know you, I periodically go back and reread it because, while it talks a lot about what’s currently in business, I look at it as talking a lot about the opportunities that businesses have in order to create a better experience within whatever platform they’re on, and I love the story of coffee: how coffee has gone from beans to, over time, the experience of going to Starbucks, and why do we go to starbucks. Bob: Yeah, it’s a great story of the experience economy. Another one, Pete, would be Apple. When the iPod and the iPhone came out, Apple was trying to attract a new customer base with some very innovative products, but the Apple experience became much more than just the device in your hand. When they came out with iTunes, iTunes online became a part of that experience that extended the device to get you music and other content. Then, when they came out with the Apple Store, the experience, all of a sudden, became more physical and real, and people go into Apple Stores not necessarily to buy something but just to browse, perhaps talk to the geniuses at the genius bars, perhaps talk to each other about their experience with Apple products and, ultimately, as you know, Apple’s retailing environment actually leapfrogged over other retailers. They want to be like Apple because of the Apple experience. Hopefully that’s helpful in explaining the experience economy. Peter: Oh that is, because I’ll look at my own computing purchasing and I used to be all in Dell, but I didn’t have that great customer experience. Once I came to Apple, it has been a wonderful customer experience in all aspects and it’s got me now all in Apple. I know we’re not here to talk about Apple and everything around it, but one thing I really want to discuss today is that you are a pioneer. You’re a pioneer in this this virtual facilitation, the virtual classroom, and we’re not talking web apps. We’re not talking just a PowerPoint slide. It’s how to facilitate a virtual classroom, a virtual meeting, and I’m just going to throw that to you and let you run with it. Bob: Okay, well I’ve been passionate about virtual meetings, virtual collaboration, virtual learning ever since I saw the first virtual meeting platform, which was back in about 1997, and I got very excited about the potential for the virtual classroom, Pete, because I could see subject matter experts being able to extend our reach to many, many more people than they ever could when they were in a classroom. I thought we would have a revolution on learning with virtual classrooms. Unfortunately, we’re 20 years later and it really has not taken off as much as I had hoped and expected and I think a lot of it is due to the challenges with virtual facilitation. If you combine the challenges of doing that with the overload of PowerPoint that we have in business – PowerPoint has not only had a negative impact on face-to-face meetings and learning but it’s had a huge negative impact on the web, because we all go to webinars and in most of the webinars we attend we spend 80 percent of the time spent pushing PowerPoint out. I’m sure you can relate to that. Bob: And very little time spent interacting with the audience, either through polling, through texting or, worse yet, through voice, because people are probably on mute multitasking and, if you call on him, they’ll have to scramble to come back and answer you. So that’s kind of the current state but I haven’t let that hold me back. I really believe that, as businesses go global and as the Millennials become such a significant part of the workforce, that virtual learning, virtual meetings will become a differentiator for many companies, and I’m working with some right now that are passionate about achieving that differentiation. Peter: We’ve had this conversation for many years. We’re talking about virtual learning, not virtual compliance, where we’re just checking the box. This is about true learning in an online environment, because this is something else I remember from your “TEDtalk” on the experience economy, about scrapping learning, and when you walk out of a classroom how much is being held back, how much are you retaining and then how long after that are you down to maybe retaining only 10 to 20 percent, and we should be retaining a lot more leaving a classroom. Bob: Yeah. That’s one of the deep dark secrets of not only could the corporate training environment – of which, as you know, companies spend billions of dollars on corporate training for a variety of reasons: sometimes for compliance, sometimes because employees just feel entitled to training as part of what they get every year, whether they have compliance requirements or not, and sometimes it’s used for strategic purposes, but it’s not always effective. We really need to move the needle on low retention, low application to really powerful impact of learning and development. I spent on my career trying to do this and I’ll probably spend the rest of my career trying to help companies do it, and try to do it myself. Peter: Well, if we think back to when we first met and you introduced the platform of ThinkTank to me (and we’ll talk more about that), when I was introduced to it I think one of the first things I mentioned this would be the greatest thing for learning how do we develop a course around it? And I think in 2011 it was still somewhat new, but can you describe to the audience and tell us more about the ThinkTank platform? Because I think it is the game changer out there. Bob: Yes, I have used a lot of a virtual web platforms and some of them, unfortunately, have been very good but have actually gone away because the company acquired and the software got retired. We’ve had some really good ones over the years but, today, we basically know four or five that are primarily used for meetings, and that would be things like WebEx and GoToMeeting and Adobe’s products, but ThinkTank has actually been around for over 25 years. It was pre-internet. This was not somebody’s really good idea when they saw the web. It actually was an outgrowth of research that was being done at a university by faculty, and the research was on collaboration. This was way ahead of their time back in the late 80s, researching collaboration, and what they came up with was some guiding principles for best practices in collaboration – and one of them was the importance of anonymity. Now, if you think back to the late 80s, most of the collaboration that was going on was in a conference room with flip charts and so, if you called out an idea, the only way it would have been anonymous is if you had a mask on and muffled your voice because otherwise everybody knew that came from Pete, he’s the boss and I’m not going to take issue with that. So ThinkTank created a software platform, at the time the company was called Group Systems, that allowed people to enter their ideas – say, in a simple response to a brainstorming question – and when they typed in their response it was anonymous. So if you had 10 people online together and, again, this could have been in a room. At the time, people could walk into a conference room, a laptop would be ready for them to sit down at, the software would have been installed and then the facilitator would start the brainstorming process, or the polling process, and it was all anonymous. That really has been a breakthrough because, if you think about virtual meetings where you want to get collaboration or virtual learning where you want collaborative learning to happen, and the anonymity opens it up. People are going to be more open, they’re more honest, they’re more eager to participate, they don’t hold back, and that’s the fundamental of ThinkTank from the time it first was started. The company and its platform have had a long journey but I started using it in my consulting business five years ago and I use it every day. Peter: Correct me if I’m wrong but you provide a lot of feedback to ThinkTank on things that they could be doing, other things that could be adding to this platform, and they’ve made a number of changes based off of your suggestions over the years. Bob: Yeah, I mean they have a few people, in the country and around the world because it is being used globally, who really do use it all the time. Those power users are able to give them ideas and tips and, as with any software platform, if you really want to master a platform – and that that’s hard because very few people have mastered PowerPoint or Word – you really get to the point where you begin to see little glitches and challenges that need to be fixed, and every time you do a new version of the software they try to fix the little things. So I enjoy helping them continuously improve their software. Peter: Okay, so let’s talk about being anonymous. This platform can be used here in Chicago but you could have your team from around the world on here, and you’re doing brainstorming and the great thing is we’re all anonymous, which takes me back to one of the brainstorming things that I teach: the use of post-it notes, because those who are in our profession tend to be a little bit more introverted, per se. They may not want to say something because of that fear, so for the brainstorming session just write something on a post-it note, stick it on the wall. I can’t read handwriting, I’m getting ideas out of people’s heads. To me, when I think about how powerful that is just from a post-it notes perspective and knowing what I know about ThinkTank, I look at that ThinkTank as the superhero in this whole thing. Bob: There is no doubt. We do have a problem, more and more today, reading people’s writing because we don’t hand write that much. We’re typing all the time. So when you do use post-it notes you do run the risk that you can’t read a lot of what goes up, and if you can’t read it and you want to capture it later and type it up you can’t get it all because you can’t read it. So, in ThinkTank, it’s kinda natural Pete. We all know how to type and some of us type really fast, and in ThinkTank, if a question gets posed and I have 10 people online together, I can get 30 responses in about two minutes. Matter of fact, I’m working on a very creative application with ThinkTank. I’m working with the great grandniece of Thomas Edison, Sarah Miller Caldicott, and we are doing very strategic innovation sessions on ThinkTank. We have an application, or an activity I should say, where we ask people in a small group, seven or eight people, to list a bunch of needs that they have related to a problem they’re trying to solve. What are the needs of the users? It’s amazing how seven people can use ThinkTank and they can generate 50 to 60 needs that are very substantive, in just about 10 minutes, and then once we have the list we can use the categorization functions of ThinkTank to bucket the ideas, discuss them in buckets, move them around, copy them and then, finally, take the pockets and rank them. So it’s a very iterative collaboration process that ThinkTank enables. But, to drive this home, you and I talked about this a long time ago. I mean, you taught courses on IFRS, and when you would get into a course with people who needed to learn IFRS, probably one of the first things you wanted to know is what questions do you have about IFRS? If you’re standing in the front of a classroom and you ask that, you may be lucky to have one or two hands go up. Partly because people don’t know what to ask, they don’t want to look like they’re not knowledgeable, but with ThinkTank and the anonymity they can type in the real questions, even the stupid ones, and then they can see what other people are typing and they may think “I have that same question, let me word it slightly differently because of my situation,” and now, as an instructor, you have great raw material to make your class better. So that’s just an example of how this can be used with learning in a technical topic, even. Does that make sense? Peter: That makes sense and I know we’ve talked about that a lot, and the ability for people to feel much freer in asking questions and making comments, and you and I both know the only stupid question out there is the one that’s never asked. Nine times out of ten there is really no such thing as as that “stupid question.” I know that you have a pilot course out there on business writing that I sat through a 90 minute version thereof, and I’ve got a face-to-face course on business writing, and I think my immediate response after that 90 minutes was “oh my god this thing is awesome,” and it’s doing what it’s supposed to be doing in that type of classroom. Can you give us an overview of that class? Bob: Yes. It’s actually a course that I have been using as a Chief Learning Officer, with a consultant that has been a longtime colleague of mine, and we ran that course at Grant Thornton and some other firms. It was a classroom course, so it was a two hour course or a four hour course, and it was targeted at groups of people who did similar types of writing. So, auditors, national office technicians who were writing white papers and responses to interpretations of FASB bulletins. Think about that: how important that writing is. It could be customized for different audiences and it was extremely well-received, and I think more and more it was because it was a rare opportunity to actually do some writing in the class – not just look at PowerPoint slides. It wasn’t going back to college. What’s really striking, when we started doing this online, Pete, is we would ask the question of everyone who came: what writing training have you had in your career? And it was astounding. The answers were coming back from a wide variety of people in a lot of different farms, and they were going back to college or high school and they hadn’t had any formal writing training, in their companies. It wasn’t really surprising, but to get it validated through responses – and you saw that, in the class you went to – was pretty amazing. It really does show a huge gap in the communication skills of people in business and so everything they learned they do from habit. They may read some good emails and see some things they like and change, but they’re really not getting a chance to have training from an expert in business writing, and that’s what we’re doing. We’re running a writing for today and tomorrow course that’s highly interactive in ThinkTank and my role is to be the virtual facilitator, and Curt Peoples’s role is as the subject matter expert because he’s been teaching business writing courses for 20 years. Peter: You said something very important: that you are the virtual facilitator of this course. Let’s talk about skills and being a virtual facilitator. What are some of the key skills in being a virtual facilitator? Bob: Yeah, it’s really great question because this is a key competency of the future, I believe, and I have done so much training of people over the years in presentation skills and facilitation skills related to that that I basically, and I’m passionate about doing, so I want to improve. I take feedback very seriously, and I have gotten myself to where I’m very confident when I go into a virtual facilitation situation, even executives who, obviously, you better keep engaged or they could be out of there in five or ten minutes. For example, we recently did a series of virtual focus groups attended by senior people in a professional services firm and we kept them engaged in a virtual focus group on a very important topic, for two hours, and it was very exciting to see not only the engagement and the contributions but also the level and quality of input that we were able to gather in ThinkTank, in that timeframe. If you go back to the skills, I think one thing that makes people anxious about doing this, first off, is that they can’t see their audience. When you don’t know how your audience is reacting, it could be negative, it could be people multitasking, it could be people have left the room and you don’t know. That causes one level of anxiety. But the the bigger issue around the skills is is how you pose questions and how you gain responses that you aren’t necessarily expecting. So, if we go back to the IFRS example, you could get 30 questions and you might see 15 that you can’t answer, and you might immediately get anxious about how you’re going to respond to that, so you have to have a confidence of being able to improvise. Perhaps looking at new questions that come that you’re not familiar with, perhaps going back and asking for follow-up, or perhaps connecting the dots between a few questions improvisationally and going back to the group. So I think one of the things that we talked about is that improvisation is a really important skill for virtual facilitation, and I don’t know if that’ll make sense immediately to people, but it’s something that we could probably spend a whole hour on. Peter: Well, yeah, I was kind of leading the witness there because we have had a long conversation about improvisation skills in virtual facilitation because you’re dealing with the unknown so you have to be listening to what is being said, whether that listening is what has been written or on the call, and you have to be completely focused in order to adapt to the situation. I know that you and I spent a lot of time earlier this year talking about virtual facilitation through the use of improvisation. So much so that we both attended, along with a colleague Alice, a workshop at Second City called Improv for Business. 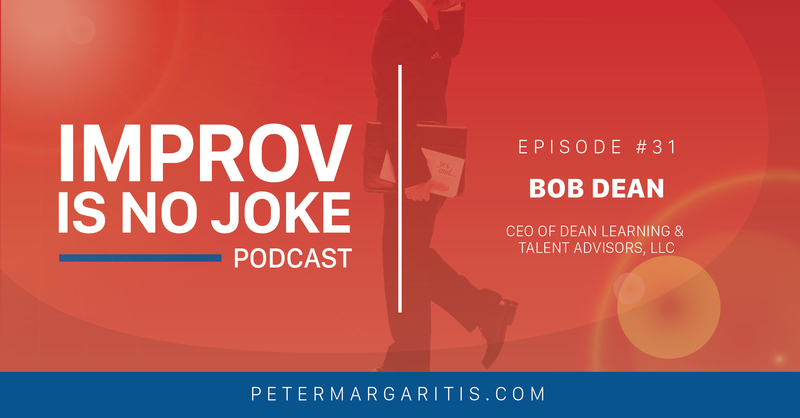 Bob: Yes, that was extremely powerful and it really kind of crystallized for me some of the things I was already doing naturally and being able to understand that some of the improvisational techniques at Second City are really very relevant to business, and I’ve actually been involved with Second City people training business people for years. Generally it’s seen by business people as something that is kind of fun and out-of-the-box but not necessarily totally relevant to the way they interact with each other or with clients, but in the world we’re living in now – in this instant world, Pete, a lot of people expect an instant response. If you get a text and it’s somebody texting you to get information and you don’t respond quickly, for whatever reason, it’s going to leave an impression. So I go I wonder why he doesn’t respond. Does he not know what to say, does not know the answer or is he not there? 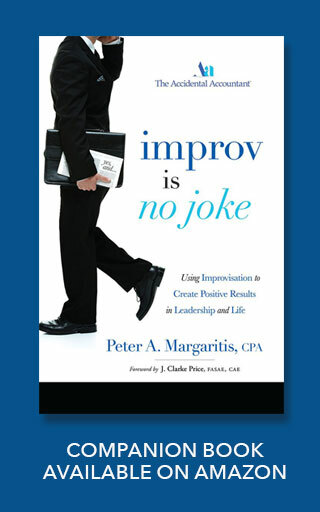 So this notion of the instant response in a face-to-face situation, or in a virtual situation like we’re in, it requires some level of improvisation, sometimes, to be able to respond quickly and I think the relevance of improv is greater now, in business, than it ever has been. 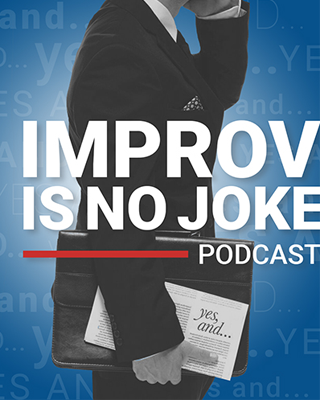 The other thing is we know there’s a new book out from Second City called Yes, And and we learned that the power of Yes, And is very, very relevant to virtual facilitation. So let me again make this clear because, when we have a webinar where there’s 47 powerpoint slides in an hour and five minutes of Q&A has been carved out at the end, there’s no room for improvisation there. Bob: The PowerPoint is there. It’s not going to be changed, and if somebody goes off topic the presenter usually goes right back to the PowerPoint. But if you’re in a virtual learning program where there’s only six PowerPoint slides in two hours and most of the content is going to be created by the learners – in response to questions, doing activities, doing polls – then the facilitators have to be ready for anything. Not only that but every session they do could be different. Different questions, different responses, and improv is really an important part of being effective. Does that make sense? Peter: [laughs] Yeah, just a tad bit. Just so the audience knows, I did not bribe Bob. He had a copy of my book and he’s been reading my magazine articles, and one of the articles really struck him. We got into this conversation about, “Wow, I didn’t really realize I’ve been improvising the whole time I’ve been doing virtual facilitation because really I’m not working with a script.” Really, to tie it back to the experience economy, I’m working with my learners and adapting a program to provide a different type of classroom experience for them so that, when they walk out, they’re walking out retaining more information than they would from a PowerPoint-driven type of presentation. Bob: Well, actually, it’s great that you brought it back to the experience economy because the tagline for that book, on the cover, is work is theater and every business a stage, and when I got certified in that book my goal was to change that to learning is theater and every classroom a stage. Now, when I use virtual, I’ve got to say learning is theater and every virtual learning platform is a stage. So there’s a chapter in the book he called the four forms of theater because, if they’re going to have theater on the front of the book, they better talk about it and Pine and Gilmore, the authors, took it upon themselves, when they wrote this book, to get educated on the four forms of theater and one of four forms of theater is improv. Bob: And so when we took your book around improv and the experience economy I made a connection that I had seen at a fairly high level, but now I see that it’s the future. I believe it’s the future. You don’t you don’t hear the word improvisation in business that often today but I think, if I’m going to be passionate about the impact of virtual facilitation and virtual learning for the rest of my career then I’ll be talking about improv a lot from here on out. Peter: Well I’m glad you embraced the passion because I think, when I first read Experience Economy, I loved the first part of it when it talks about how we’ve gone from mom making a cake to chucky cheese on birthdays, but it was it was that second half of that book, when they’re talking about every business as the theater aspect of which I really gravitated to, and obviously I saw the improv piece, which really struck my attention, but when I think about when we all left Chicago, I think that was like April of 2016, so we went in with kind of my book, we understood my work and my perspective of it. We got the perspective of Second City to the Yes, And book, which I’ve bought and read a couple times, and it was so easy to make that tie-in to the experience economy. But I love the twist you just added to it, and I’ve never heard you say this before but I’m a complete believer in this: where learning is a theater. We’re there to perform, and I guess when I think about it I really feel much more confident when I say I am the Chief Education Officer. Peter: Because I look at it as a theatre. Bob: Well, you know another word that you and I had a big AHA together with, at the Second City training, was ensemble. The word ensemble. I was just at Second City last Saturday with my wife at a show called Unelectable, which is very timely for today’s political environment. By the time people here at this podcast, the election may be over, Pete, but right now it’s still uncertain and I watched with new, fresh perspectives what was happening on that stage because the ensemble that had been chosen to play in that show, and there was six people, were unbelievable in their ability to work together, to co-create, to have each other’s back and make sure that they were going to be successful in whatever they were trying to do spontaneously. I think another aspect of virtual learning is, if you have a three hour program on writing for today and tomorrow and you have two facilitators and a couple of clients sponsors in the virtual program, along with 20 participants, those facilitators and those clients sponsors, or color commentators if you will, they’ve got to be an ensemble. They can’t be a silo group who’s never talk to each other before. How many times in training have we seen the client sponsor comes in to open the program and then immediately leaves the room, and that’s not an ensemble. That’s a siloed approach to learning, and if learning is theater then learning requires an ensemble of people to get the job done, and part of the ensemble, Pete. may just be people who got involved in the design process and a dry run and are very excited about what’s going to happen, but don’t have to always be there for the the live or the archived experience. Peter: And do you remember that email that you sent me? Bob: Yeah. That Ryan Lochte had just become a star for the wrong reasons, at the end of the Olympics, and it just happened four days before and this showed had been going for several weeks, but Ryan Lochte not only became a topic in the show, so they changed that the show because of that, but there actually was a multimedia element to that Second City show on the stage that I’m eager for you to see because his picture was also up on the stage, on the screen. Peter: Wow that’s really adapting to the current situation, making things relevant. If we can do that in the classroom as well, because, as you as you described earlier, I’ve got 47 PowerPoints that I’m gonna drill through and how often we are adapting those to what’s current in the learning environment? Or even what’s happening in today’s world? Bringing that into the classroom has a much stronger impact in the learning process. The better the story we can tell in the classroom, the more were able to retain. Bob: So there’s another thing going on in the learning space that is definitely using different language but you’ve probably heard of it. It’s called of the flipped classroom and the notion is to take some of that content, some of those 47 powerpoints, and make a video off youtube or a ted talk or whatever, and make it pre-work so that, when we do bring the group together, we don’t have to read the powerpoint. We assume you digested it, however you got it and whatever that content was, in pre-work, and if it took you more time than somebody else that’s fine. You’re doing it by yourself so you take the time you need, but once we come together as a community of learners let’s use that time for collaboration. We both know Tom hood. Bob: He’s been on your podcast. He’s a huge believer and the fact that he believes that collaboration is the future of learning and that collaboration is actually more important than experience, and what we’re getting at there is we all know we learn from experience. We have, just in the audit world, we have significant experiences with client projects and we learn from those, but how often did we actually share them? When did we get a chance to, other than at the water cooler back in those days, how did we share them? Well now we can share experiences through collaboration. We can get them out quicker, we can get response to them quicker, and the essence is that collaboration is more important as a learning design element today. So, if we can get that content behind us in pre-work, we can then use the live time to collaborate. One of the things that you saw in that writing course that I’m really excited about, and this is hard to do, is using ThinkTank for pre-work because you can design some very compelling activities that might include questions and polls, and what I’ve seen lately is really encouraging. People actually will do it because they’ve been used to this concept of pre-work through email. You sending out a PDF of a white paper, as the instructor, and telling people they need to read it and saying, “oh, by the way, if you have any questions or comments go ahead and email me back.” Well if that really happens and everybody gets CC’d, we’ve got an immediate overload of stuff that most people don’t want. Bob: So the notion of going into ThinkTank and individually providing your comments, your input. Read the white paper but put your comments, and in an activity that everybody can read. That’s been very well received. Peter: You took me down a path that I haven’t thought of before. You’re talking about pre-work and the flipped classroom and those who do the pre-work and those who participate in the pre-work can collaborate at a higher level than those who do not do the work, which took me back to my early stages of being introduced to improvisation. I still I tell the story of when I was in my third workshop and I’m still trying to figure it out and the instructor, after we were done, said, “Okay, for next week I want everybody to go out and research the seventies. Book, music, current events, shows, movies, whatever. Just research the seventies.” And those of us who did that pre-work came in the next week and we rocked. Those who didn’t failed miserably. As you were describing this pre-work piece, it took me right back to that because, in that virtual classroom, we’re all coming with what we’ve read and we can apply what we know and our experiences to be much more collaborative in that environment than if we’re just pushing PowerPoint out. Bingo. Bob: Well, I will go back to experience economy again because the reason this book is so compelling and that the authors have been able to certify over 200 people in the world in the models and frameworks of the book is because every chapter, just as I talked about the four forms of theatre, has a new model. One of the models that I learned from this book was the five stages of an experience. We think about an experience, and I have a great experience that you know about frequently, and that’s going to Wrigley Field to watch a Cubs game. Bob: And that’s my immersion in the game. That’s my engagement with the games. But there are two parts of that experience, on each side, that people often don’t think about. On the front end, there’s attracting people to the experience and then entering the experience, and at Wrigley this year the entering process was actually unique because we had to go through security screening to get into the stadium for the first time ever. Bob: It’s not necessarily viewed as going to be a positive experience, but they’ve actually made it a positive experience because they realize we don’t want entering the stadium to become a downer for people who are excited about coming to a Cubs game. And then the other side of the experience is exiting and extending the experience, and so the exiting process is really walking out, no matter where you’re leaving the stadium, and having all these smiling people with Wrigley caps on and Cubs caps on thanking you for coming and hoping that you come back soon. That’s just a little thing but it does leave you out with a smile on your face, and then of course extending the experience is when I email you when I get home and tell you about this great Cubs game I went to or the great Second City thing I went to and we’re talking about it now, so we’re extending the experience. Now that’s a long way of sharing where pre-work fits in. Pre-work is attracting people to the learning experience and entering the learning experience, and when you have entered the experience through some compelling pre-work you’re ready to go when the live experience starts. Does that make sense? Peter: Yes and you’re able to contribute a higher level then you would be able to, and that’s the beauty of it. It’s what you contribute to the conversation, how we build on the conversation and your experience and knowledge, and helping to grow that conversation. Yes, I am very jealous of Bob because of his season tickets at Wrigley. I’ve been to Wrigley, I’ve extended the experience, but I think my version of extending the experience was going to Sluggers after the game and maybe going to Sluggers even before the game. But then I’d go to the Atlantic ballpark and you can’t extend the experience because you leave it and there’s nothing there in that extended experience. Bob: While extending experience at Wrigley can, for me, oftentimes include just going and getting on the L to leave Addison station and go to wherever my car’s parked, and it’s kind of fun, Pete. You get on there and all these people on the L just left the Cubs game, ninety percent of them were at the game, and you see people from out of town who don’t even know if they’re going the right direction on the L and so they want to ask the Chicagoans, “Am I going the right way?” and I’ll say, “Why, was this your first time at Wrigley?” and they’lll say yes and I’ll say, “What was it like?” So just riding the subway out of the stadium is a cool way of extending the experience. Again, when I got certified in the Experience Economy, going back to my fundamental background as a CPA and then becoming a learning leader, I thought we can do better than that learning scrap and that ten percent retention, but maybe what we need to do is apply business principles to learning and development – and the experience economy is a business book. It’s not a learning book. So I’m trying to take these models and frameworks from business that work with companies like Starbucks and Apple and many, many others and use them in learning. Peter: We will leave that to some degree as the last word because what I want to do is stop the the interview now, but before I do I’ve got about ten questions I want you to answer so the audience knows you. But I think it’s a good stopping point to let people digest this information to this podcast. You well know that you will be back on this podcast again for part 2, to extend the conversation even further and pick up where we left off because, quite frankly, we both know that we could be here for a couple hours just because we’re both so passionate about learning and development that this conversation could go a very long way. Bob: Yeah, let me just leave another parting shot, since you kinda opened this with the experience economy and virtual learning. I believe virtual learning needs to be an experience. Peter: Yes, all learning needs to be experienced but even much more so virtual learning. In order to get rid of the distractions you want to be immersed in that process of learning. So, before I let you go, I don’t think that I’ve prepped you for this prior to the podcast but I like that kind of end my podcasting by trying to get the audience to know you just a little bit better. I’ve got ten questions, they’re easy. Are you ready? Peter: He’s a little nervous. I can tell by the voice. I’ll just start it off easy. Bud Light or Old Style? Peter: Now you surprised me. Bob: Only because it’s hard to get old style today. Bob: They used to sell it at Wrigley but Budweiser bought them out. Peter: Oh, I didn’t know that because the last time I had Old Style was when I was at Wrigley. PC or Mac? Bob: PC, although I’m very loyal to Mac from the standpoint of an iPad and iPhone, but I still am sitting here in front of a Dell laptop. Peter: Okay, Midway Airport or O’hare? Bob: O’hare. I actually think O’hare is a very efficient airport. A lot of people who come there to make connections have a bad experience, but as a hometown airport it’s pretty cool. Peter: [laughs] Okay, and I know a lot of my friends who have gotten transfers and connections in O’hare and have not had that great experience. So who’s the biggest villain: Steve Bartman or the Billy Goat curse? Bob: Well it’s probably the Billy Goat curse. Bartman got a bad rap. Peter: I agree he did get a bad wrap. He was in the wrong place at the wrong time. What’s your all-time favorite song? Bob: That’s an interesting one. I’m a big Nat King Cole fan from way back. I’ll say many of his songs, but I’ll say Mona Lisa. Peter: Okay. What’s your all-time favorite movie? You’re sitting there on a Saturday, you’re flipping through the channels and all of a sudden you see it on and you can’t flip any more. Bob: Yeah, well you know I’m a big baseball fan so there’s actually two of them. One is The Natural. Bob: And the other is Field of Dreams. Peter: Ah. Build it and they will come. What’s your favorite restaurant in Chicago? Bob: My favorite restaurant in Chicago is Harry Caray’s, both downtown and in the suburbs. Peter: Okay, so I know that your big Cubs fan and Wrigley lover, and that’s one of the great ballparks in the U.S., but what’s your favorite ballpark to visit that’s not in Chicago? Bob: Well, it’s Camden Yards in Baltimore. I lived in Cleveland for 11 years and I was there when Jacobs Field opened and that was cool because that was a great stadium, but it opened right after Camden Yards and I used to go to the DC area a lot and I made a lot of visits Camden Yards and that is just an incredible ballpark. I have been in the old memorial stadium in Baltimore and I could see the difference, just as I also saw it in Cleveland. Camden is a great place. Peter: Well I just learned something new because you and I were both in Cleveland at the same time, because I remember when the the Jake was built and opened and I had spent a number of times at Cleveland Stadium. Me and 5000 my closest friends watching an Indians game, back in the day, and I was actually at the game when the A’s are in town playing the Indians and the ball bounced off of Canseco’s head for the home run. So that’s my claim to fame in Cleveland baseball. I know you’ve traveled a lot. What’s your favorite city to visit on business? Bob: It’s probably New York. It’s fun to go to New York on business for a short trip. I wouldn’t want to live there but there’s always cool things to see, including going to Broadway shows there. Bob: Which is always great. Peter And last but not least, what book are you currently reading? Bob: Well, I’m reading a book that we talked about earlier: Yes, And. Bob: I haven’t made it through the whole book and I’m reading that one, but I think I’m going to send you another book that just came out from one of the authors of The Experience Economy, Jim Gilmore, and this book is called Look. This book is about improving your observational skills and one of the things Jim says, Pete, is that we’re deteriorating in our observation skills today because we spend much of our day observing a screen in front of us. Bob: And not looking at the world that we’re missing behind the screen. So this will be a wake-up call to some people when they read this book and I highly recommend it. It’s going to be great. As a matter of fact, I’m going to be a lunch and learn with Gilmore and in Chicago in a couple weeks and I’m really looking forward to it. So I haven’t read the book yet, but it’s coming. Peter: Well cool. I’m going to have to pick that book up because that that sounds like something I would want to read, and when you were saying that it reminded me of the comedian George Carlin. Not about the seven words but he coined the phrase vuja de: to look at everyday things as if you’re looking at them for at the very first time, and I think if we’re behind that screen so much then just by removing the screen and looking at everyday things for the first time, what perception do you have, how does it look to you now and what can you do with that, and what kind of creativity can you draw from that? Bob: You can’t be improvisational if you’re looking at a screen. Peter: Exactly. So Bob, once again, thank you so very much for taking time out of your busy schedule. I’ve enjoyed the conversation and I know my audience will too. Bob: Okay, thank you Pete. Great to be with you. Good luck with the podcast.